"The bilateral agreement on civil nuclear cooperation is yet another demonstration of our mutual trust," Indian Prime Minister Narendra Modi said in a statement. India had grown increasingly wary of former president Mahinda Rajapaksa's pursuit of closer ties with China, which became a key supporter of the island's economy after its 26-year-civil war ended in 2009. Modi said the two countries also agreed to expand defense cooperation, but gave no details. 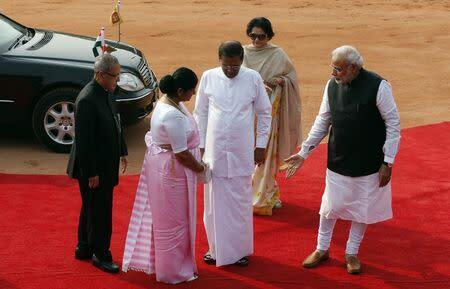 "This is my first visit and it has given very fruitful results," Sirisena said. China said last month it hoped for continued "cooperation" with Sri Lanka despite a pledge by the new government to review Chinese infrastructure projects awarded under the Rajapaksa administration.